For many, this means depriving themselves of good food! 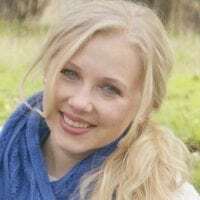 What if I told you that you can indulge and eat healthfully? With a few swaps and tweaks, you can enjoy your treats… without sacrificing your health! This easy dessert captures sweet and slightly tart flavors, all in one cup. The smooth yogurt layer melts in your mouth while the pomegranate sauce adds a delightful crunch. Dress it up in pretty wine glasses (as pictured) for an elegant treat or serve it in half-pint Mason jars to brighten your kids' school lunches. Thanks to the gelatin, it'll never become a slosh-y mess, although it is best refrigerated. Either way, rest easy knowing you're satisfying your sweet tooth and nourishing your body with probiotics, gelatin, and more! 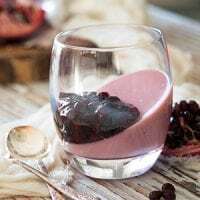 For a clean-eating treat, look no further than this healthy probiotic pomegranate mousse! A perfect way to satisfy a sweet tooth with in-season produce! In a small bowl, sprinkle gelatin over 1/2 cup of pomegranate juice. Mix quickly and set aside to bloom. Heat 1/2 cup remaining pomegranate juice in a small saucepan over medium heat. Once barely boiling, add juice in the saucepan to bloomed gelatin juice. Whisk to combine. Add honey and yogurt. Combine well. Pour into glasses or Mason jars. To make slanted yogurt as pictured, set wine glasses in a muffin pan at an angle. Or, you can use a deep square dish -- simply cover the dish with a hand towel so that there are wells in the towel for the cups to rest at an angle. Gently transfer to refrigerator for at least 2 hours. In a small bowl, sprinkle gelatin over 1/4 cup of pomegranate juice. Mix quickly and set aside to bloom. Heat 1/4 cup remaining pomegranate juice in a small saucepan over medium heat. Once barely boiling, add pomegranate juice to bloomed gelatin. Whisk to combine. Add honey, lemon juice, and pomegranate arils. Combine well. Place in ice bath for 5 minutes to chill. Watch carefully that it doesn't set (if it does, simply place it back on the stove to thin slightly). Gently spoon 2 to 3 tablespoons of the pomegranate sauce on top of the yogurt mousse. Transfer the cups back to the fridge for at least 15 minutes, then serve and enjoy! 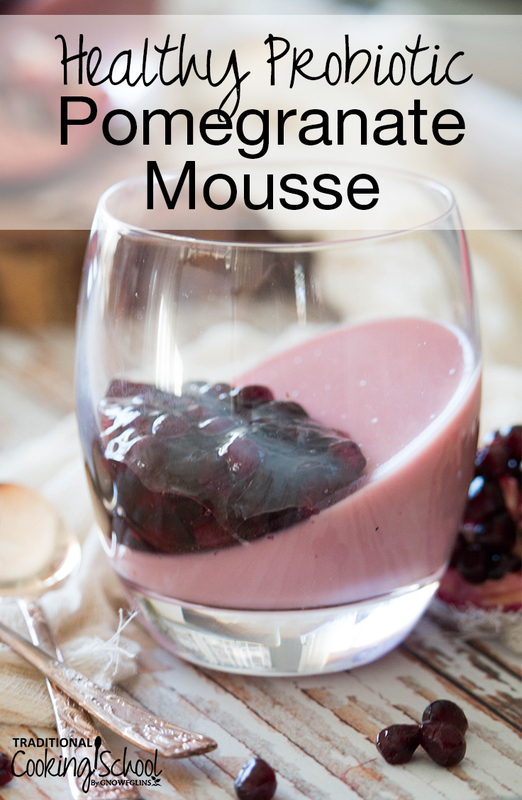 Be sure to make this healthy, probiotic mousse while pomegranates are still in season!